In early August, crossbikes were painted at seven intersections around the city – the first two in Concordia neighborhood. If you see one, don’t fret. Treat them exactly like they sound: like crosswalks, but for bikes, almost. In Concordia, they are on 33rd at Going and on Killingsworth at 37th. Elsewhere, they are at N.W. Johnson at 21st, N. Williams at Rosa Parks, N.E. Tillamook at 15th, N. Michigan at Killingsworth, S.E. Lincoln at 60th and N.E. Rodney at Fremont. Another 15 are planned. All are on neighborhood greenway streets. 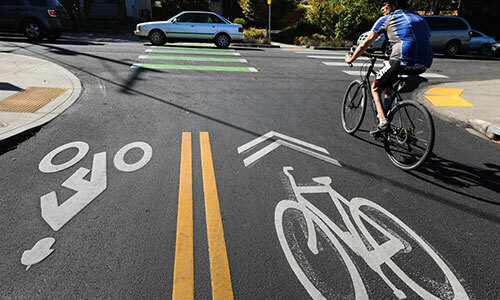 Roger Geller, Portland Bureau of Transportation (PBOT) bicycle coordinator, said it’s just the latest effort the bureau has undertaken to make crossings safer on what are designed to be low-stress, family-friendly streets where priority goes to people on bikes and on foot. The crossbike locations must meet specific criteria that have been vetted by Geller and PBOT traffic engineers. They are used only on what are known as “minor collector streets” – a designation that applies only if the street has (at the most) one lane of traffic in each direction, no more than 10,000 cars per day (with 1,000 in the peak hour) and a maximum speed limit of 30 miles per hour. Each marking costs about $4,000, including signs and crosswalk striping if necessary. Geller said crossbikes are an idea he’s be working on for several years, and it came from how he observed people using curb extensions – where curbs are bulbed out to narrow the crossing distance. Legally-speaking, crossbikes aren’t crosswalks. In a crosswalk, drivers are required by law to stop for anyone on bike or foot who shows intent to cross. Not so in a crossbike. But if you’ve walked or biked at all in Portland, you’ll know that people tend to happily stop at neighborhood greenway crossings already, so these markings should only increase awareness. PBOT plans to work with a Portland State University researcher to evaluate the new markings to see whether they improve conditions. Jonathan is publisher/editor of Bike Portland. This story is condensed from BikePortland.org coverage of the crossbikes. Contact him at Jonathan@BikePortland.org or 503.706.8804.